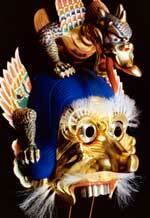 Nanbu Shusui, a sculptor in Toyama, was commissioned to make a new Ranryo-oh Mask for Meiji-jingu. We had an honor to paint the mask in bright colours. 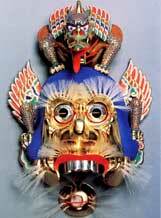 Made of cypress wood and silver on eyes and teeth, yak hair on eyebrows and beard. Ranryo-oh Mask is used in one of the traditional Japanese dance based on the episode of an warrior Gao Changgong in the late Northern Qi dynasty. Gao Changgong was a brave warrior of Northern Qi who had an overwhelming beauty on his face, even vassals lost their will to fight. He covered his face with a vigorous mask in a fight which achieved a great victory.